When both Long-Suffering Sister and my sister-in-law (hmm...will have to think of a name for her too) recommended this book, I was very keen to try it. Both are so very different that if they both liked it, I assumed it must be good. We Need to Talk About Kevin is written as a series of letters from the mother of a teenager who has carried out a Columbine-style shooting to her former husband. Eva is the mother of the Kevin of the title. She writes to his father to tell him about the aftermath of the shooting, the world’s reaction to it and how she has been dealing with it. She reflects on why she made the decision to have Kevin, her inability to bond with him and on the impact it had on their relationship. I have to say, after the initial excitement, I got rather fed up of this book at first. I made numerous threats to Long Suffering Sister for encouraging me to read such a long-winded, boring book. In the end I had to take my words back. 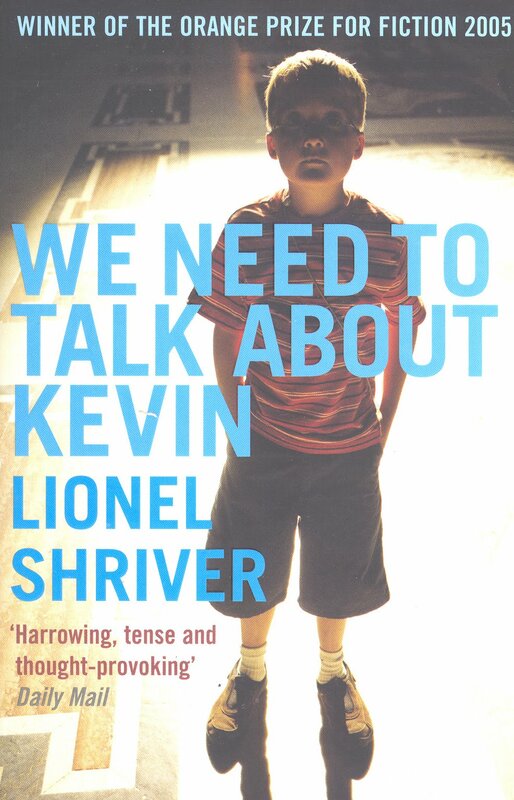 Shriver effectively conjures up Eva through her letters – irritating, self-pitying, cynical, self-absorbed, navel-gazing way too much in the way of affluent people who have had an easy life and need to think up things to tell therapists they don’t need. You start off with this book, really not liking Eva very much. The book goes on in this vein for a very long time. I lost patience a number of times and was close to giving up on this book a number of times. I am glad I didn’t. Eva’s letter also effectively describe an almost Damien-(from Omen)-like little boy who turns into a terrifying young man with almost no redeeming qualities. Every time there is some chance that Eva has gotten through to Kevin, he reverts to type as the hostile, manipulative teenager. There were times when he slightly less than convincing – Shriver’s take on the way Kevin dresses (everything tight and shrunken) jars with me - a minor thing, but one which felt wrong each time it was mentioned. Also, the fact that he is almost always so bad with no obvious reason, is hard to understand. Shriver admits in the afterward of the book, that the character of Eva is partially an exploration of her own journey towards the decision not to have children. Another key theme is the old nature versus nurture debate – is Kevin born bad? Is Eva’s inability to bond with him the culprit? Is society at fault? At times the book rambles all over the shop – Eva’s childhood and relationship with her husband, their marriage, her travels around the world, the impact of a child on her life, the multiple anxieties that come with being a parent, her thoughts on America, the world and just about everything. At times this feels like a real insight into her character, at other times you think, okay – just get on with it, when is something going to happen? The long, slow ratching up of tension and misery and the drip-drip nature of the way the letters reveal what has happened perhaps means that the ending of the book is all the more effective. I found the pay off for my patience with the book in the last tenth of it. You know what is coming and yet the denouement is shocking and painful and leaves you reeling with more questions than answers about the cause of what happens. If you really don’t have the patience for such a long, rambling (475 page) book, then Jonathan Trigell’s Boy A is a comparable book (my review here) which is far shorter and based partially on the Jamie Bulgar murder case and also a good read. I read "We need to talk about Kevin" whilst preganant, probably not the smartest thing to do, as it really scared me. I found the book unputdownable, in that I had to get to the end, and at other times, I had to put it down because it was just too painful to continue with it. This book made me weep, and also got me thinking. The message I took from this book was that parents need to be so united in how they bring up their children. In this case, the couple's marital conflicts were really used by Kevin. The father's weakness in supporting his wife, by dealing with his son, as opposed to viewing him through rose-tinted "positivity" spectacles seemed to be a real contributing factor. I also liked that the author left us with more questions then answers. This book haunted me for some time. Have you read"The Time Traveller's Wife?" yet. Your reading was a bit more thorough than mine I think, I struggled through this book quite a bit. I put the book down feeling a bit bereft. I had the Time Travellers Wife, read a bit, got distracted and now I don't know where it is!! (That sounds like the kind of excuse my daughter would come up with when I ask where her homework is). I have heard lots about it, sounds like I should look for it. I would have left your coment if it wasn't a bit of a spoiler! I was pleasantly surprised at how great this book was. Although the book is a bit slow in the begining it does pick up and you find yourself guessing how it's going to end...my guess was off the mark. Although you're not given a clear cut answer as to WHY Kevin did what he did you can draw your own conclusions based on all the 'tell tell' signs of his childhood. I don't think that Eva was any more of a 'villain' than Franklin was an absentee disciplinarian. Children DO crave boundaries. Perhaps Kevin would have responded differently had their parental tactics been role reversed?